With performance considerations driving the design of rotating equipment, operating speeds and journal loads have increased greatly in recent years, often exceeding generally accepted design limits. In order for tilting pad journal bearings to operate at load and speed levels that exceed these limits, newer innovative designs are necessary. 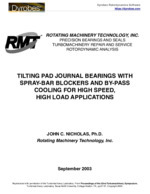 This paper concerns the development and implementation of a reduced temperature tilting pad journal bearing design that features spray-bar blockers and by-pass cooling. The sequence of design improvements began with evacuated housings with directed lubrication, then progressed to offset pivoted pads, spray-bar blockers, and then finally to behind-the-pad by-pass cooling. Many design application examples are discussed illustrating the progression of innovations leading to the final reduced temperature bearing configuration. Actual application unit loads and surface speeds start at around 350 psi at 250 ft/sec, progressing to about 495 psi at 285 ft/sec and ending up at approximately 770 psi at 350 ft/sec and 470 psi at 420 ft/sec.